The University of Central Florida’s NanoScience Technology Center is developing a new program to make a graphene-based spray coating that would help multiple industries easily and inexpensively fight corrosion. The center is building on the recent success of UCF spin-off Garmor, Inc. in making a powder form of super-strong graphene available to industry. 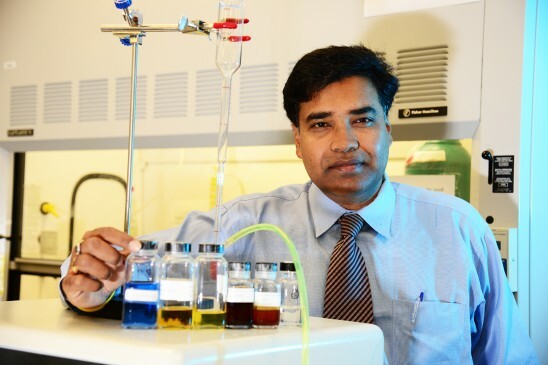 “We can use graphene and composite materials to produce new ways for automotive, aerospace, oil and gas, the military and even the medical industries to take advantage of this extremely powerful material,” said Sudipta Seal, director of the NanoScience Technology Center and Advanced Materials Processing Analysis Center and a professor of Materials Science and Engineering. Seal has published articles on the strength and flexibility of aluminum composites reinforced with carbon nanotubes that is central to the process. The goal of the program to is to provide a cost-effective, large-area polymer/graphene based coating technology to both strengthen mechanical components such as materials used for the construction of aircraft and cars, and protect materials such as gas and oil pipelines from corrosion. The research program will concurrently focus on developing graphene oxide, a plastic host and a plasma spray. Garmor, Inc., a UCF spinout company that has licensed technology developed by NanoScience Center researchers Richard Blair and David Restrepo, will assist with formulating the graphene oxide. The scientists will modify graphene, which originates from graphite like that in pencil lead, so it can be adhered to a plastic host and sprayed onto a surface while retaining its innate strength and elasticity. NanoScience Professor Lei Zhai will focus on developing the material to host the graphene and ensure the graphene keeps its electrical and mechanical performance when embedded. The composite development element is being led by Seal, who will configure the graphene agent for performance testing on steel, aluminum, and high strength plastic. The coated substrates will be evaluated for their mechanical (abrasion and strength) as well as corrosion performance. Companies and potential students interested in learning more about the project should contact Seal at Sudipta.Seal@ucf.edu.